Charming, soft in communication Pisces-Monkeys leave the most pleasant impressions about themselves. They are able to support any conversation, are benevolent towards others: an easy smile rarely leaves their lips. However, outside the calm you can see a vulnerable, restless soul. According to the combined horoscope Pisces-Monkeys — mysterious people with extraordinary thinking, not indifferent to everything mystical. They are bright, creatively gifted people, having on everything their own opinion, different from the opinions of others. Communication with them is a great pleasure: they are distinguished by quick thinking, curious character. They are not polite, polite and tactful: they inspire with their own example, and not with loud slogans and flowery speeches. 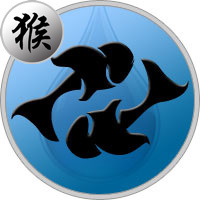 Sensitive and impressionable Pisces under the guidance of the dexterous Monkey gain self-confidence, become more businesslike and enterprising. In this combination there is no place for dreaming and laziness of Pisces. But they remain faithful to their enthusiasm for everything mystical: they trust intuition more than verified facts. Monkey-Pisces - a contradictory combination, giving birth to people prone to unpredictable behavior. They have the ability to quickly navigate in the current situation, they are able to find non-standard solutions. They act faster by instinct and anticipate events than accurately plan their future. Moreover, this tactic of behavior brings its fruits: success, prosperity, universal recognition. To win a good attitude with Monkey-Pisces is quite difficult: trusts very few people. Rather, he prefers communication with a limited circle of people, than it will shine with eloquence and wit in an unfamiliar company. At the same time, it’s equally nice with friends, and with strangers. He does not pursue fame and success, he does his business calmly, but he does not miss his own. Monkey-Pisces does not share his plans with anyone, makes an impression of a mysterious person: to herself on her mind. Always busy with something particularly important, not fussing and not nervous — her life goes on, no matter what. Capable of capturing anyone, picking a key to your heart, if, of course, there is a need. Like everyone without exception, does not cause anger and irritation, on the contrary, people are happy with the success of Monkey-Pisces. Monkey-Pisces easily turns any situation in their favor, always turns out to be a winner. Not afraid of change, perfectly adapting to new conditions. The main feature of the Pisces-Monkey sign is resourcefulness. The cunning Monkey will not miss any opportunity to improve his position, and Pisces intuitively determine in what direction it is necessary to move. Therefore, people of this combination successfully cope with difficulties, easily overcome all obstacles on their way. Do not lose optimism, do not complain to others, but methodically achieve their goals. Unperturbed, calm and balanced — completely satisfied with their lives. After all, people do not need to know about all their doubts and experiences. Charming Monkey-Pisces attract men and women with their softness and defenselessness. At the same time they know their own worth, are demanding and capricious, they find it difficult to trust someone. It is much easier to maintain the appearance of a good relationship than to open your heart and share true thoughts. According to Monkey-Pisces’s love horoscope — passionate, sensual nature, hiding their temperament from others. It takes time that they can get used to the partner and fully open up to him. A loving Monkey-Pisces is open to feelings and emotions, it needs a trusting relationship. He can not be called a good family man: he is inclined to betrayal. If he does not find love in the family, he seeks an understanding on the side. Although with age, becomes a loving and caring partner, able to forget about their interests for the sake of the well-being of loved ones. In relation to children, it manifests itself as a wise parent. Perfectly understands their needs, tries to help solve problems. In professional activity, Pisces-Monkey manifests itself as a responsible worker. Despite some pessimism and slowness of Pisces, this man persistently and resolutely achieves his goals. Dexterous and inventive Monkey knows how to achieve success without putting considerable effort. Monkey-Pisces gravitate toward creative professions. They differ in developed imagination, rich in fantasy and strong intuitive instinct. They can not do boring work, they are striving for something new, not ordinary — they are talented people with non-standard thinking. Monkey-Pisces subtly feel the mood of others, are able to negotiate with anyone and anything. Perfectly oriented in what is happening around: they can make quick decisions, they have strong intuition. Although they make the impression of good-natured people, they firmly defend their interests. Monkey-Pisces is quite capable of organizing a profitable business. True, they are prone to extra spending, do not control their expenses. They need a right advisor and an explanatory assistant, in this case they can fully devote themselves to their favorite business. Modest Monkey-Pisces men make the impression of restrained people. But in their soul raging passions and emotions. Intellectually and creatively gifted people are able to take place in any profession. Strong intuition tells the right decisions, and the ability to communicate helps to smooth out acute angles. Therefore, Monkey-Pisces, for all its softness, indecision are quite successful businessmen. They attach great importance to material values, try to provide close people with everything necessary. They are reliable men who perfectly understand the feelings and experiences of women, although they tend to fleeting intrigues and romances. Sincerely try not to upset his wife and not to give her excess problems, are considered good husbands and exemplary fathers. Spectacular women Monkey-Pisces invariably attract the attention of men, seem to be gentle, airy creatures in need of protection. In this case, quite sober-minded people, endowed with strong intuition. Although they do not consider it necessary to listen to the voice of reason, they prefer to go on about emotions. They like to feel the master of hearts, with pleasure give themselves to the game of passions. Often they are unhappy in a romantic relationship, but they quickly find a way to be comforted. Strong intuition, the ability to foresee future events always help them out in difficult situations. Monkey-Pisces are gifted women, the actress’s profession suits them, although they can also take the role of personal assistant to the leader.